Insulin is a hormone released by the pancreas that regulates the amount of glucose (blood sugar) in the bloodstream and helps the body store excess blood sugar for energy. Normal insulin production allows blood sugar to enter tissues and be used as energy; without it, glucose builds up in the bloodstream because it cannot enter the cells. The buildup of glucose in the body can have major health consequences, including nerve damage, kidney damage and blindness. Type 1 diabetes occurs when the pancreas fails to produce insulin, which can lead to a buildup of glucose in the body. As individuals who have Type 1 and Type 2 diabetes do not produce or do not have enough insulin in the body, they must inject insulin into the bloodstream after they eat to prevent glucose from building up and to help the body either use or store the blood sugar it needs from food. While it isn’t a widely known type of eating disorder, diabulimia has become an increasingly common and dangerous way for women with Type 1 diabetes to lose weight. Diabulimia is a type of eating disorder that involves the purposeful reduction or manipulation of insulin intake; this deliberate under-dosing or omitting of insulin is actually a type of purging behavior that allows the individual to eat without the consequences of eating unwanted calories. This type of behavior induces hyperglycemia (too much sugar in the blood) and causes the loss of glucose in the urine as a way to control weight. As women with Type 1 diabetes already have to chronically and strictly manage their food intake, insulin administration and dietary patterns, these restraints can easily turn into an unhealthy focus and trigger an eating disorder. A study by Rhonda M. Merwin, Ph.D., and colleagues examined the withholding of insulin for weight control among 276 individuals with Type 1 diabetes. The researchers found that 98 percent of their sample reported binge eating when they thought their blood glucose was low; the frequency of binge eating was associated with weight-related insulin omission. Especially for women with Type 1 diabetes, insulin therapy causes weight gain, which can make it that much more likely that they will end up developing maladaptive ways to lose weight. 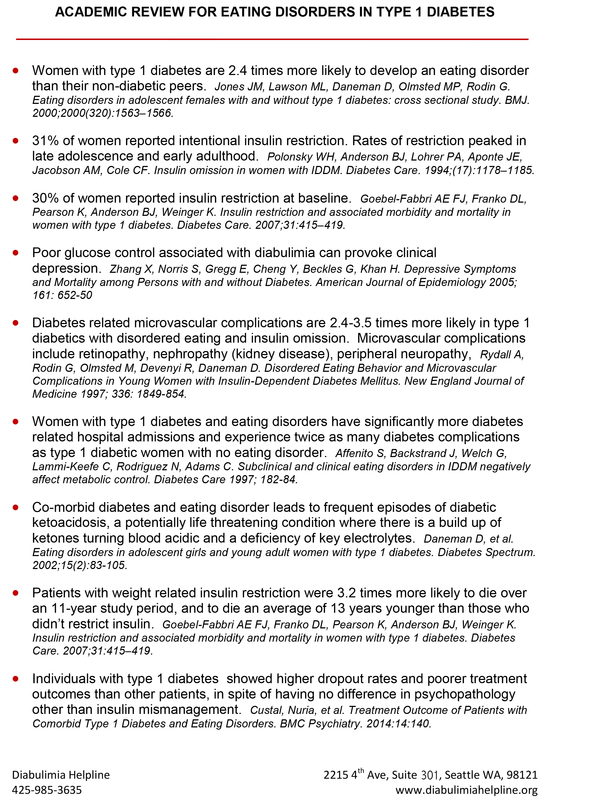 In fact, women who have Type 1 diabetes are more than twice as likely to develop an eating disorder compared to women who do not have diabetes. Research suggests that over 30 percent of women ages 15 to 30 who have Type 1 diabetes have intentionally withheld some degree of insulin. Some studies have found prevalence estimates ranging from 30 to 57 percent. 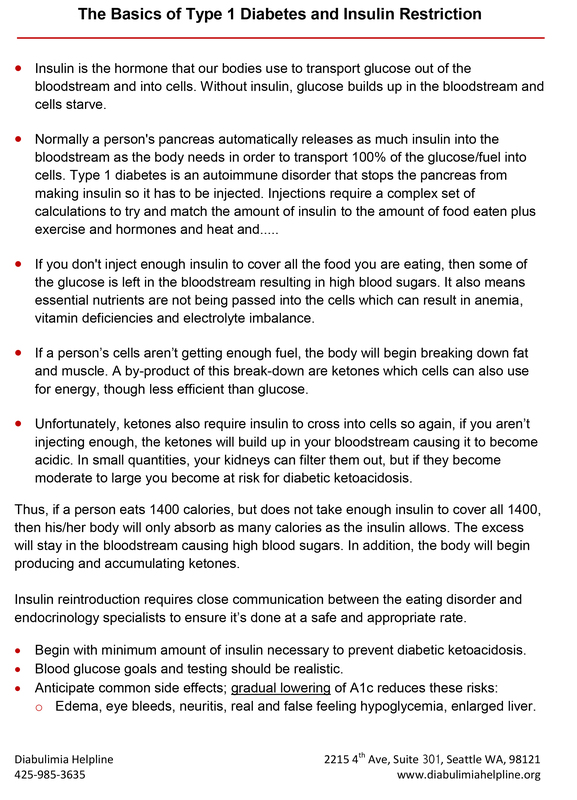 Withholding or omitting insulin is an extremely dangerous way to lose weight. Doing so may lead to irreparable nerve damage and can even be life-threatening. As a leading provider of mental health and substance use disorder treatment, Sovereign Health of California provides evidence-based, individualized behavioral health treatment services, which include treatment programs for patients with eating disorders. To find out more about our treatment programs at Sovereign Health, please contact our 24/7 helpline to speak to a member of our team. Amanda Habermann is a staff writer for Sovereign Health. A graduate of California Lutheran University, she received her M.S. in clinical psychology with an emphasis in psychiatric rehabilitation. Her master’s thesis was written on “The effect of parental codependency on elementary school children’s social and emotional development,” and her research has been accepted for poster presentations at the Western Psychological Association. She brings to the team her extensive clinical background and skills in psychological testing and assessment, clinical diagnosis, research and treatment, and recovery techniques for patients with mental illness. She is a passionate researcher and enjoys staying up to date on the newest topics in the field. For more information and other inquiries about this article, contact the author at news@sovhealth.com.